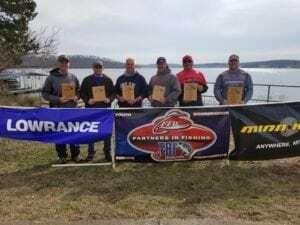 Spring fishing can be a fickle challenge for anglers and Stockton Lake presented a full range of variables for the second Missouri TBF Qualifier. Dock talk from practice had rumors of 10-pound bass and a wide range of patterns producing large numbers of keepers being caught in many areas of the lake. Alabama rigs and Wiggle Warts seemed to be the dominate pattern, but wobble head jigs and spinner baits were in play with the seasonable weather on Thursday and Friday. Water temps ranged from 50-57 degrees during practice with moderate winds from the West, great conditions for all the anglers to find a pattern for the weekend. As so often happens in the spring, mother nature had one last trick up her sleeve for the anglers to overcome. This spring has had several severe cold fronts and Saturday started with clouds and wind, which can make Stockton a rough lake to navigate. Several practice spots were blown out on Saturday, forcing anglers to adjust both their locations and lures. As is always the case, some of the anglers made the adjustment and lead the way in the standings in a very tight race. Leading the boater side was our defending Missouri TBF champion, Ken Whitfield. After an exhausting week at the TBF National Championship Ken came to Stockton on short rest to find a pattern that would produce the winning sack. Ken stayed in the main lake area and the Little Sac arm and used a wide range of baits (surprise) to bag a 10 fish limit of 24.61 pounds. With few big females being caught Ken waded through multiple keepers each day to slowly upgrade his bag by ounces each day. He primarily used an Alabama Rig and spinner bait but supplemented the catch with some Rock Crawler fish each day. Finishing second in the event was Tim Merkh with 10 fish for 23.78. Tim really worked hard to upgrade his bag, wading through 10-15 keepers each day. Even with changing conditions his bite was consistent, using a Wiggle Wart fished parallel to the bank. He fished near the take-off and dam staying in the clearer water to catch all his fish. Our third-place angler was perennial qualifier, Brian Maloney. After just missing the top 3 at Lake of the Ozarks Brian met the challenge at Stockton with 10 keepers for 23.49 pounds. Like our other qualifiers he caught multiple keepers each day, upgrading his sack by ounces throughout the day. He started each day in the main lake area dragging an A-Rig in 8-12 feet of water to get a quick limit. In an effort to upgrade his bag later in the morning he would run up the Big Sac arm and throw jigs and jerk baits on bluff wall ends, finishing his day up back at the dam area looking for another big fish like he caught in practice. Leading our Co-Angler field was Troy Richter with an extremely strong performance with the only 10 fish limits of 20.68 pounds. Troy culled each day, moving up critical ounces several times. As a co-angler Troy had to adjust to his boater locations but used an Alabama Rig effectively each day to catch his fish. The second-place co-angler was one of our more consistent back-of-the-boat anglers, Jon Small. He followed up a strong 4 fish performance on Saturday with 5 keepers on Sunday for a total weight of 17.42 pounds. He overcame the stress of boat problems on Sunday and continued to use his Alabama Rig to catch his fish. Rounding out the co-angler field was one of our new friends from Kansas, Darrin Jones. Like all the qualifiers Darren caught lots of fish between 14-16 inches and were able to piece together 8 keepers for 16.68 pounds. Overall Big Bass honors went to one of our co-anglers, Tim Biondo, who presented a 7.25-pound lunker to the scale on Sunday. Also finding quality fish, and cashing checks, were Brad Tyer 5.47 pounds, Trace Hannaford 5.63 pounds and Jeff Finch 2.85 pounds. Winning the coveted Presidents Award for the boater with the best co-angler bag were Troy Ladehoff and Faron Morris. Taking home, the Ranger Cup bonus was our second-place boater, Tim Merkh. Since Stockton represented our last Qualifying event it also was the end of a very tight Angler of the Year race. Squeaking out the win on the Boater side in a tie breaker was Troy Ladehoff (17 fish), tying Brian Maloney (16 fish) with 390 total points. Finishing first on the Co-angler side was John Driver with 388 points, ahead of Jeff Finch with 384 points. Congratulations to all our Angler of the Year contestants and thanks for such an exciting race! Over the last few years Lake of the Ozarks has a reputation for being one of the best options in the Midwest for spring anglers suffering from cabin fever. Unfortunately, mother nature (and the Corp of Engineers) had a little trick up their sleeves as anglers gathered for the first Qualifier of the year on March 17th & 18th. Due to heavy rains and a rapid draw down of the Lake the normal clear to slightly stained water of LOZ was replaced with cold dirty water from the dam to mid-lake. The only options for anglers was either to adapt to the cold, dirty water or limit their efforts to the clearer areas of the lake in the Gravois arm or in the back of the larger creeks. Adding to these tough water conditions was the usual variable spring weather that delivered sunny skies with highs of 70+ degrees for practice and cloudy days with lows of near freezing at take-off for the tournament. These conditions we met by large field of strong field anglers which included local experts like Brian Maloney and Jody Hughes along with many veterans of the TBF events with impressive resumes like Don Heiser, Roger Edwards, Farron Morris, Ken Whitfield, Mick Maples, Tim Merkh, Trace Hannaford, Darren Woebke, Greg Lampton and Jerry Lovell. The co-angler side was also loaded with past Qualifiers in Gary Martin, Patrick O’Neal and Troy Richter just to name a few. 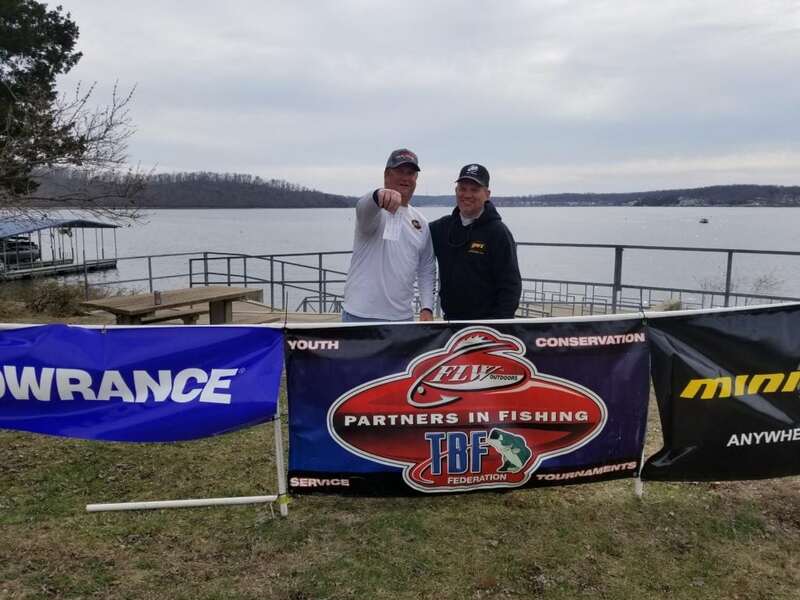 In addition to the strong field of Missouri TBF veterans we were excited to welcome our new member clubs from Owensville Anglers, Osage Valley Bass Anglers and Show Me Statewide. 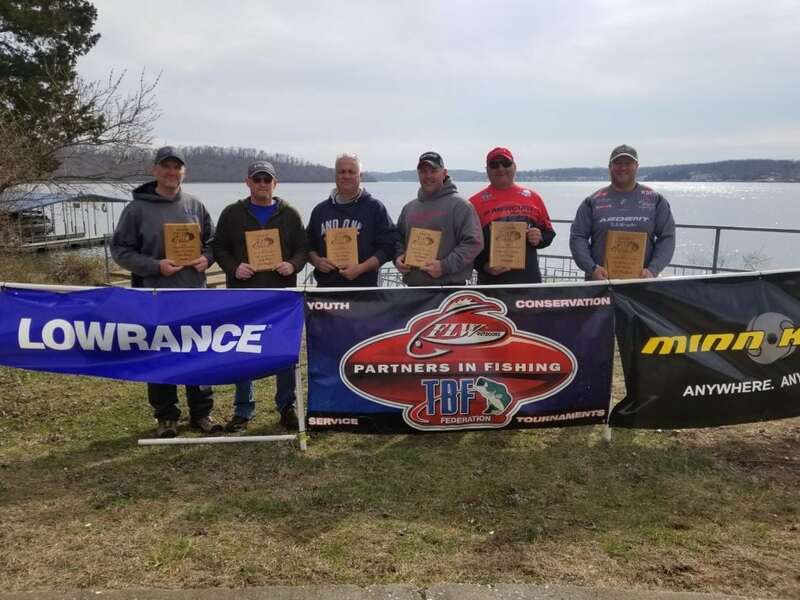 While these were new clubs to Missouri TBF they included several experienced tournament anglers like Tom McGovern, Wes Proctor, Kaleb Chockley and Andrew Schoenekase. As a result of the solid turnout from current members along with the addition of the new clubs, we were able to field 21 boaters and 20 co-anglers for the event! The first practice day on Thursday was sunny and warm with highs in the low 70’s followed by colder, damp weather on Friday. The official two-day event began Saturday with strong North winds for take-off with temperatures hovering around 40 degrees. This made for rough water which further limited anglers who may have been considering big runs to get to clearer water up the Osage. Several nice fish were brought to the scales, led by Troy Ladehoff (5.49 lbs) and Tim Merkh (4.96 lbs) on the boater side and Kaleb Chockley (4.26 lbs) and Shelby Thacker (3.34 lbs) on the Co-angler side. These big fish pushed Jerry Lovell (13.53 lbs) and Kaleb Chockley (9.57 lbs) to the top of the day one leader board. Sunday started out even colder but with lighter winds and less boat traffic. While this may have made the anglers more comfortable, the new conditions changed the bite requiring everyone to adjust their patterns again. Big bass was won on day 2 by Brian Maloney (6.05 lbs) and Thomas Kaufman (5.96 lbs) as boaters and John Driver (5.35 lbs) and Wes Proctor (4.91 lbs) on the co-angler side. Topping the field on the boater side after day 2 was one of our new members, Robert Hime. While Robert may be new to Missouri TBF, he is a proven veteran tournament angler who is very familiar with Lake of the Ozarks. He used this local experience and a pair of crankbaits to sack 28.03 pounds of bass under very tough, variable conditions. On Saturday he fished from the takeoff towards the dam taking advantage of a good early bite. He focused on the cleaner coves/cuts, but had lots of boat traffic to compete with for the key spots. On Sunday he concentrated on areas around Grand Glaze which presented a different challenge with it’s dirtier water. He used a classic Ozark-pattern custom painted Wiggle Wart by Commemorative Creations along with another crawdad colored medium diving crankbait to land his fish. The key to his success was his consistency and patience, as the only angler to bring 5 fish to the scale each day. Finishing second on the boater side was Brad Tyer who used an A-rig and Rock Crawler to bag 19.35 pounds. He focused on channel swing backs in the Gravois arm, looking for clean fishable water. He remained focused through a tough morning bite, catching most of his fish in the afternoon. The tough bite also meant that Brad had to make every opportunity count and was able to land all of his 8 keeper bites in the 2-day event. On the Co-Angler side was won by a dominating second day performance by Wes Proctor. After a solid first day with 3 fish put him in 6th place, Wes was able to land the largest co-angler bag of the tournament on day 2 (13.07 lbs) pounds giving him a total of 18.78 pounds. As with all co-anglers Wes showed his versatility by catching both spotted and largemouth bass on both a jig and hot vintage Wiggle Wart. Sadly, the bait died a hero and was lost to an old metal dock on his last cast of the event (but I think he knows a guy that has another one for sale!). Wes not only had to adjust to 2 different boaters but had to fish 2 separate areas, catching his fish near Shawnee Bend on Saturday and near the dam on Sunday. The second-place co-angler, John Driver, used 2 different strategies too. On Saturday he delivered a solid 3 fish bag and decided to follow the “fewer is better” strategy on Sunday with only two big fish that weighed 9.67 pounds on Sunday giving John a total of 15.81 pounds. On Saturday he followed his boaters pattern and threw a jerk bait to land his fish early with a late fish caught in the PM to round out his sack. On Sunday he was sitting on a “zero” at 11:30 when he pulled out the A-Rig on a dirty water bank and caught his 5.35 and 4.32 pound females on the same point! Finishing 3rd on the co-angler side was Shelby Thacker with 5 quality keepers for 15.63 pounds. He used his local knowledge to team up with some less experienced Ozark boaters to find fish in familiar spots in the Gravois. He used a shaky head worm (yes, I said shaky head) to catch fish on an uncommon bait in uncommon spring water in depths up to 20 feet! Now we just need to work with him on some truck driving issues I am told? We would like to thank all the boaters and co-anglers for competing at our first Qualifier. As with any event, not everything goes as planned and the Board appreciates everyone’s support and patience. 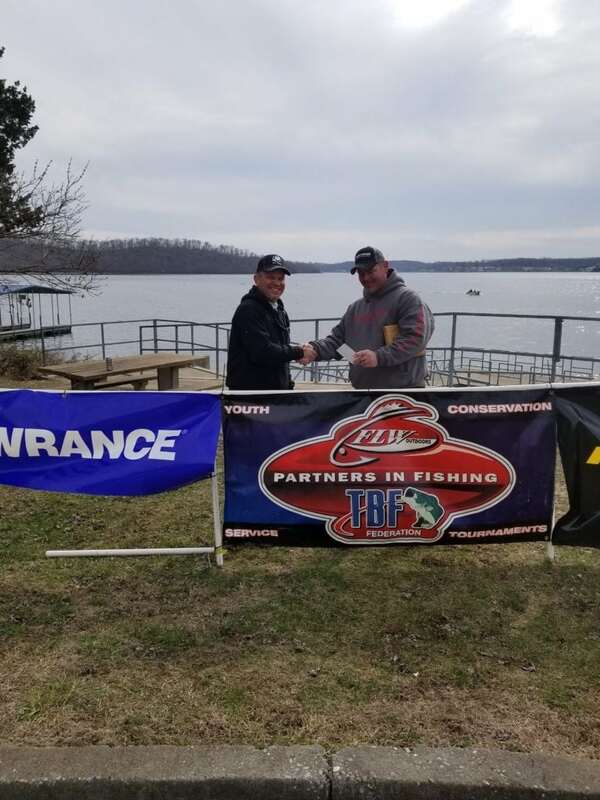 I received several compliments from new members on our boater and co-angler sportsmanship which should make everyone proud to be a member of the Missouri TBF. greatly appreciated. We are excited about the rest of the 2018 schedule and hope that all of you can join us at Stockton for our second Qualifier and at Truman Lake for our First Annual Team Championship! TBF National Semi-Final to be Hosted by Missouri TBF in 2018! 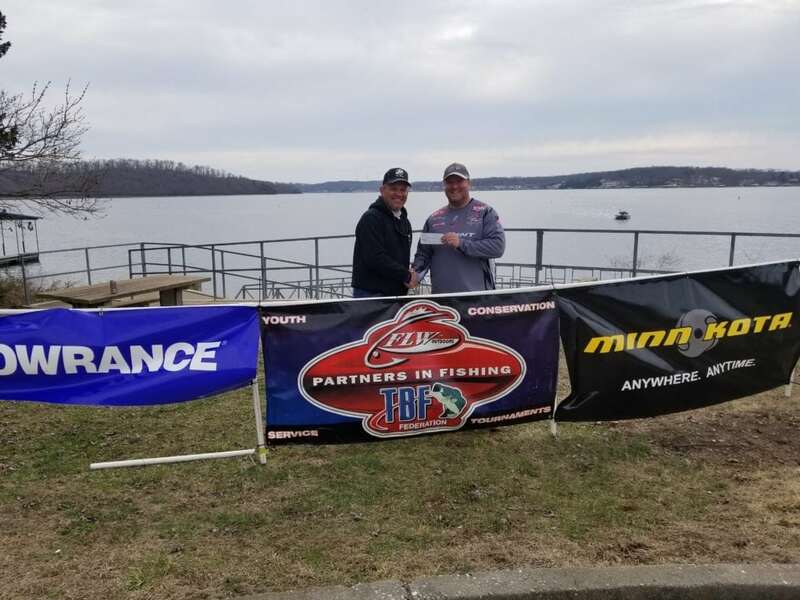 This year TBF anglers will have a home field advantage at the National Semi-Final which will be hosted by the Missouri TBF. The National Semi-Final is open to anglers who qualify through events hosted by their state federation or by winning their club boater and/or co-angler championship. 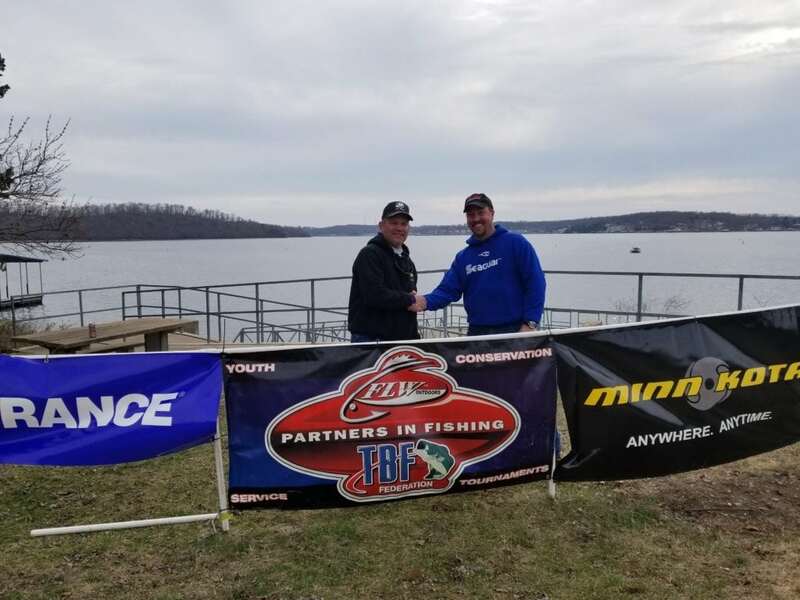 The Missouri TBF has chosen to hold the event in 2018 at Stockton Lake. Orleans Trail Marina will be the location for the event scheduled for October 13th & 14th. Stockton Lake has a solid reputation for a fall bite, with a lot of different patterns that should be in play. With an expected field of 30-35 from Missouri and Kansas, Stockton is the perfect size to allow anglers to explore the lake while giving plenty of room for everyone to find their “sweet spot”. The event will include 2 days of formal practice with a banquet and pairings on Friday night. The 2 day event will be based on accumulated weight with separate categories for boaters and co-anglers. Leading boaters and co-anglers from each state will move on to the TBF National Championship in 2019 (location TBA). Prize money and trophies will be awarded for the top overall anglers and co-anglers at the event along with “Bragging Right” award to the top state team. Missouri TBF Announces Qualifiers for our 2018 Season! 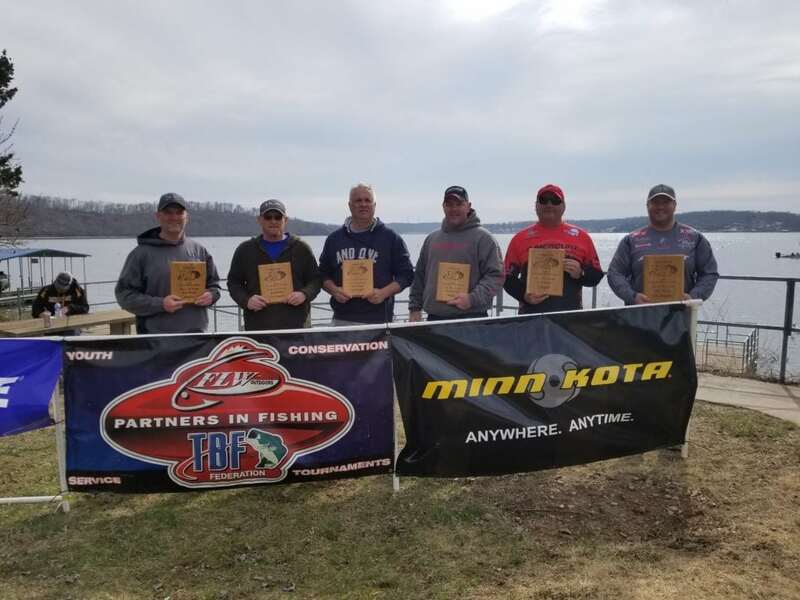 The Missouri TBF has selected two of the hottest lakes in the state for their 2018 Qualifiers. The first qualifier will be held at Lake of the Ozarks (Shawnee Bend Ramp) on March 17 & 18th. The second event will be at Stockton Lake (Orleans Trail Ramp) on April 21-22. This schedule will put anglers on lakes with healthy fish populations during the best time of the year. These lakes provide anglers with a varied range of cover and structure meaning several techniques will surely come into play, giving all anglers a great chance to catch some big bags. The two-tournament schedule gives anglers twice as many chances to qualify for the National Semi-Final. 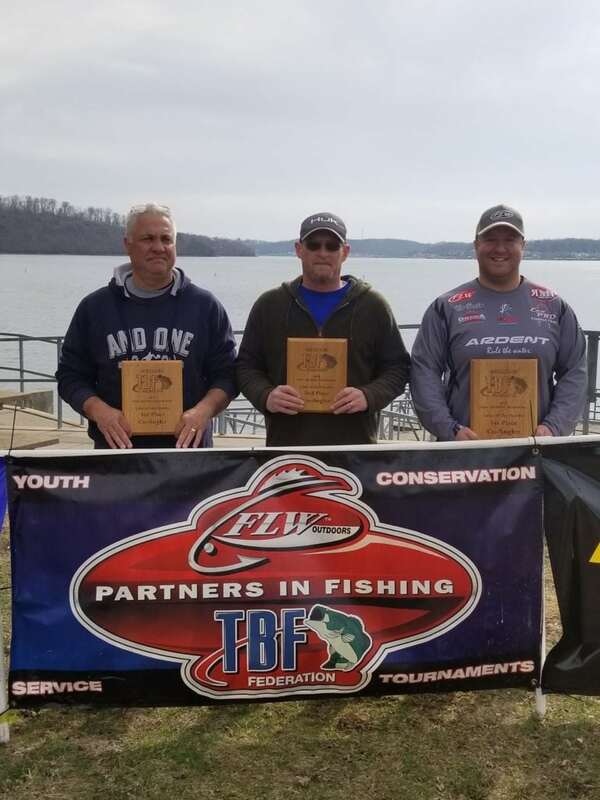 Unlike some circuits, the Missouri TBF has two separate statewide tournaments which helps clubs and their anglers avoid family and other commitments each year and still have an opportunity to qualify for advancement to the TBF National Championship, BFL All-American and even the Forrest Wood Cup. This is not a “series” format, instead the top 3 anglers and 3 co-anglers from each event will move directly to the TBF National Semi-Final this fall. This means that anglers can fish the Qualifier, the National Semi-Final and the TBF National Championship all in a matter of 12-16 months! Last year the traditional “draw” format for the Qualifier was changed, with boaters and co-anglers being scored separately. This means boat partners will not be fishing against each other during the day, assuring a friendly experience for everyone (see Tournament Rules for full details). In another move that is sure to be popular the TBF has lowered entry fees for boaters and non-boaters! At the Qualifiers anglers and co-anglers will be fishing for daily big bass payouts, trophies and expense paid trips to the National Semi-Final. Additionally, annual Angler and Co-Angler of the year prizes and trophies will be awarded to the top point getters over both tournaments. In order to participate in the Qualifiers anglers must have annual dues and individual entry fees paid at least 7 days prior to the event. Entry forms for the Qualifier are available on the website or from your club President. Clubs or individual anglers who are interested in joining the Missouri TBF should contact Jon Small at (816)560-2722 or Dennis Maggart at (816)718-0335. We have clubs across the state that are looking for boaters and co-anglers so if you are an experienced tournament angler or a weekend guy wanting to have fun and learn more about how to catch big bass please give us a call.